In celebration of my first lomography sale, I just bought myself this adorable little camera charm necklace from Oh, Hello Friend on Etsy! I'm still reeling from my print sale, and am now very excited to receive this awesome necklace! That was me! They came in yesterday and they are gorgeous! Still not sure I know what lomography is. I am going to frame them for the master bath. Can't wait. Thanks! That necklace is so cute. I want one now!! There a lot of cute things on etsy. Oh, I love that necklace! Great charm! Bonnie, thank you again for the purchase and support! Lomography is actually a Russian style of photography. I fell head over heels in love with the style a few month ago, and now all I can seem to do is take photos everywhere I go! so cute!! i'm headed over there! oo oh hello friend has such cute things! your lomos are really neat! 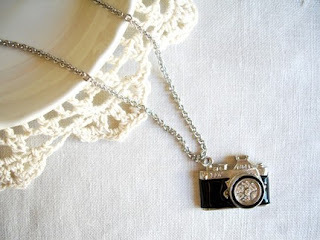 That is the cutest camera charm! Congratulations. I recently bought myself a new pair of moccasins to signify the end of another academic year, so I understand that mode of shopping therapy all too well. Congrats your shop is so lovely! Will check out your etsy site! I didn't know you sold a print! Which one? So are you part of the Lomographic Society?? I am, I have a fish eye camera and love it!! That is just adorable. Great gift idea too!